Robert Greene, an American author wrote a book entitled, The 48 Laws of Power. In this book he outlines and explain the different types of power and influence and how those who exercise them can do so effectively. A must read for those who wish to understand how power is wielded and exercised. Of relevance to this article is Law number 15, which reads, "Crush your enemy Totally. All great leaders since Moses have known that a feared enemy must be crushed completely, no amber must be left alight, no matter how dimly lit smoulders, a fire will eventually break out. More is lost through stopping halfway that through total annihilation; The enemy will recover and will seek revenge. Crush him, not only in body, but in spirit"
This was the fate of the Vice President of Zimbabwe, Emmerson Mnangagwa that fateful morning. Arrangements had been put in place to arrest and detain him as soon as President Robert Mugabe received his resignation or fired, which ever came first. As a loyal cadre of the struggle he refused to resign from his party ZANU PF, a party he has lived and sacrificed for since the war of liberation. Instead he focused on securing his safety. That fateful day, the vultures had circled in for the kill. Intelligence had reached him alerting him of the intention of Grace Mugabe and the G40 to either arrest him or kill him. Having headed the intelligence department for many years this information reached him through a network of faithful cadres. The Vice President, who later that day became a former vice president as Mugabe summarily fired him, left the country to safety. 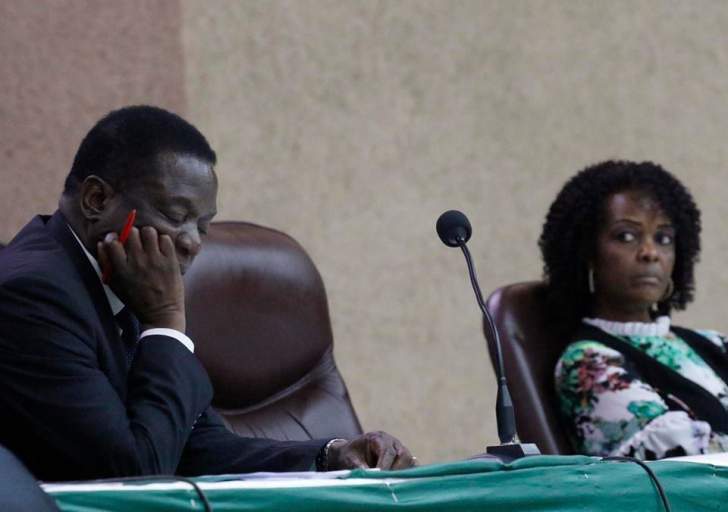 The failure to arrest former Vice president Emmerson Mnangagwa was a game-changer. The succession arrangements were premised on the complete "annihilation" of former vice president and all his allies. The idea was to follow law number 15 to the book. This would allow Grace Mugabe to ascend to the throne from vice president to president when her husband finally curves in. Now, with the former vice president out there, it is no longer possible for Grace Mugabe to became president and hold power securely. It may mean a complete rearrangement of the deck chairs until they get to Mnangagwa. So, since they failed to capture him, the next thing was to discredit him. To discredit him such that he becomes an unattractive option for anyone, nationally and internationally, hence the media blitz. The Zimbabwe independent under the editorship of Dumisani Muleya leads in this quest. The Zimbabwe Independent in an article entitled. …ousted VP faces arrest opens by saying ‘THE Criminal Investigations Department (CID) has assembled a special unit to investigate crimes allegedly committed by ousted vice-president Emmerson Mnangagwa during his long tenure in office. The unit, led by Assistant Commissioner Crispen Charumbira, includes Superintendent Nyambo Viera (CID Law and Order), Chief Superintendent Nyaradzai Majachani (CID Property Section) and Chief Superintendent Ngena (Law and Order). The case, which they are investigating cases against Mnangagwa, for alleged obstruction of justice, corruption, attempted murder and murder. The discovery of gold in kwekwe and Redcliff was both a blessing and a curse for the Midlands region. For most families reeling from the poverty created by the closure of Zisco, it was a God sent. Many have been able to feed their families by selling gold to fidelity printers and other players. The discovery of gold also saw large numbers of gold panners descend on kwekwe and Redcliff to mine the precious mineral. As humanity would have it, money can breed evil as well. Soon enough the police had to deal with a large number of murders amongst the gold panning community. According to the Zimbabwe independent all murders cases in the Midlands linked to gold panners are now attributed to Former Vice president Emmerson Mnangagwa. Surely the Gods must indeed be crazy. The Godfrey Majonga is one of the allegations put out there by Dumisani Muleya in the Zimbabwe independent. Allegations are that former Vice President Emmerson Mnangagwa caused dibalitating life injuries to television presenter Godfrey Majonga, ending his broadcasting career by causing him to jump from a high rise building some thirty years ago. In his politiburo presentation Professor Jonathan Moyo repeated the same allegations which were roundly rebutted by former vice president Emmerson Mnangagwa and a 3-million-dollar law suit is currently in the courts against Professor Jonathan Moyo. The former vice president has always denied responsibility for the incident. He stopped of mentioning the name of the person responsible in the last politburo meeting in which he gave his rebuttal to the Professor Moyo allegations. Many people who followed the philandering of members of parliament and other public servants at the time would know that the person responsible for the incident was Retired Col Sibanda. How it became a Mnangagwa issue is anybody's guess. The succession issue has taken a new twist. The dissemination of information is now being done at the highest level and being passed to journalists to appendage their names and publish. The Editor of the Zimbabwe independent is Dumisani Muleya, a protégé of Professor Jonathan Moyo. Muleya was appointed by Moyo to be in a committee that looted state funds - Zimbabwe information media Panel of inquiry - IMPI. He sat in the information platforms and content of media platforms committee. ZACC, Zimbabwe's anti-corruption unit investigated the scandal where US 5 million of ZBC salaries were diverted. In short, he is a beneficiary of Professor Jonathan Moyo's scandals and benevolence. He accepts written articles from the professor and pushes his propaganda. Junior journalists are asked to appendage their names to vary the sources of the story. The writing style however remains the same. Of late, young journalists like Bernard Mpofu and Ellias Manbo have been the front of the stories smearing the former vice president. It is no secret that Professor Moyo is the brains of the succession fight in Zimbabwe. He is the brains in the G40 outfit. Dumisani Muleya's impartiality is now questionable. There is credible evidence that he is paid to publish stories from Professor Moyo and Saviour Kasukuwere. Professor Moyo cannot push his propaganda to no nonsense editor of the Herald, Caesar Zvayi. his default outlet for propaganda is the Zimbabwe independent and The Standard newspapers. The escape of former Vice president has rattled the G40 outfit as they will now be forced to rearrange the deck chairs. It is now not possible to have a secure Grace Mugabe presidency. She will never be able to hold power securely with former Emmerson Mnangagwa being out there. In his hard-hitting statement, he has outlined his intentions. He will be back to lead the original ZANU PF with all the players expelled by president Robert Mugabe, the war veterans, ZAPU supremo Dumiso Dabengwa, Morgan Tsvangirai, Simba Makoni, Joyce Mujuru ad other democratic forces having confirmed their commitment to converge and deal with the Mugabe dynasty plans once and for all. Those that have allowed themselves to be abused by the G40 outfit in their professional capacity, whether they are journalists or policemen will find themselves on the wrong side of history. The democratisation process in Zimbabwe has begun. The writing is on the wall for Robert Mugabe and his dynasty plans will not see the light of day.